The work on digital ethnographies dribbled over into this week with continuing comments on the ethnographic studies of others in the class, and feedback to those kindly commenting on my own ethnographic study on the GA-MMA community. I made a few changes to the study artifact to take into account some suggestions made. The refined artifact is at the same URL of http://atate.org/mscel/ethno/. The week has been characterised by some preparatory work for assignments on the three MSc in e-Learning courses I am on. There is a lot to pull together, many interesting areas to explore, and readings to go back over. But I like to start such projects early, do an initial burst of activity to get some material in place, and then take a long time to reflect and refine. 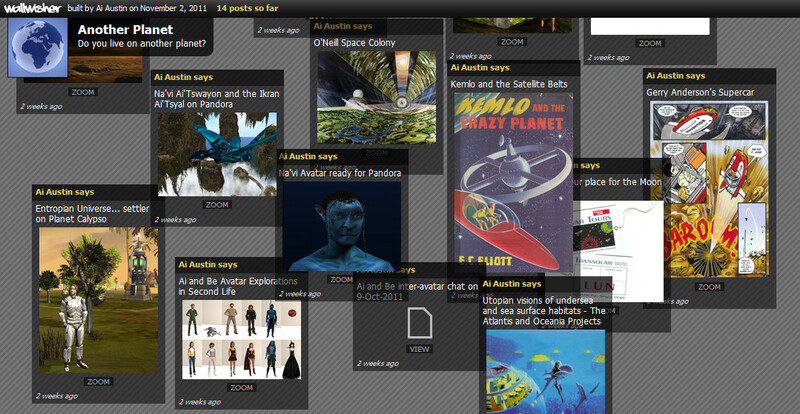 I had a flurry of activity to create a new digital artifact along the style of “AI – Avatar Identity” under the theme “Are You on Another Planet?” at http://atate.org/another-planet/ picking up on the “Other Worlds” and utopian dreams elements in earlier blocks of EDEDC. This involved setting up and the populating a new WallWisher wall and dozens of entries on that – none of which showed in my Lifestream unfortunately due to a glitch in the way that Wallwisher RSS feeds seem to come to Lifestream. It also involved some experimentation with a “grammar” of “connectors” which are meant to give a visual typography based method to show links between themes, token, topics and readings on the course. I did this originally to be a potential EDEDC final assignment topic. But as I explored, I widened out to try to take a more holistic and “posthuman” aggregating view of the work I had done on EDEDC on personal identity (Life Wall), projected identity (Another World) and community identity (GA-MMA and social networks). I have now proposed and had accepted a theme for my EDEDC final assignment in this area with working title “I, PI, with my little Eye”. My Lifesteam shows a trickle of contributing elements as I build assets and on-line materials for that. My Lifestream also shows a number of entries reflecting my continuing discussions on the use of Personal Learning Environments, and experience I am gaining with setting up and using a VLE based on Moodle. A frustrating experience as there are so many labyrinthine paths through which roles and permissions seem to be set up. The initial readings into “posthuman” literature on EDEDC are just starting to come through as events in my Lifestream. I also hope we might see comments from my EDEDC “bring a friend to class” David Richardson. I added a couple of entries on the PostHuman2011 WallWisher wall, but as noted before these do not show in my Lifestream even though I have the RSS feed set up for that wall too. I posted a blog entry giving some background on why I chose to put an image and information about my PSA avatar on the Posthuman 20011 wall. I will use some elements of this in trying to pull EDEDC themes together for the final assignment. I see also some entries which reflect the interests I have in space exploration. My twitter feeds are often dominated by NASA and ESA related activities. But in a few week’s time, we are off to Mars again. To be more precise, the names of myself, my virtual worlds avatar (who gets the original invitation due to involvement in NASA’s CoLab in Second Life), my wife, and our elderly parents (who watch these missions with interest) are this time on a chip on the deck of the Opportunity Mars Science Lab.